Find hotel near St. Catherine Of Alexandr ..
Construction on this Cathedral, begun in 1577, took 84 years to complete, due in part to an attack on the city and church by Francis Drake in the 1586. This likely contributed to the church’s fortress-like appearance. The bright yellow building and domed tower are an important part of the Old Town skyline. Designed by Simón González, with the tower by Gastón Lelarge, it is among the oldest of the episcopal sees in the Americas. It is a simply made building with few flourishes. It has a pretty portal, a gilded 18th century main altar and a Carrara marble pulpit. There are also some lovely frescoes. After you’ve checked out the church, head outside, and to the rear of the building. There, in a little corner space close to the church wall, at the crossing of the street, you’ll find a monument statue to Pope John Paul II. Ask the cathedral staff for the audio tour guide. Times given are from a secondary source and might not be reliable. This was the first church built in Cartagena. At first it was located somewhere else. But if you find it open when you pass next to it's get in. It's worth it. Really beautiful. And crucial for the Cartagena's history. Beautiful Lutheran Historic Church downtown Iceland. 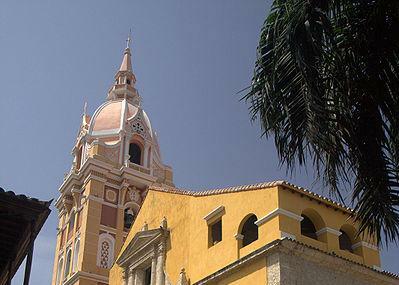 Impressive Architecture of this National Monument The Catedral de Santa Catalina dominates the skyline in the old, walled city section of Cartagena. Built in the late 1500s and finished in the early 1600s, the cathedral is known by several names, including the Cathedral of Cartagena, the Cathedral of Santa Catalina, and the Metropolitan Cathedral Basilica of Saint Catherine of Alexandria. It’s worth a quick stop to view the interior of the church, as well as to view the exterior from the nearby Plaza Bolivar. The church is lit at night, so you can get a great night-time photograph from one of the nearby rooftop bars/restaurants. It's just beautiful. I recommend you to visit it.